Turn all of your signature beverages into on-the go-refreshments with this Choice 9, 12, 16, 20, and 24 oz. clear flat lid with straw slot! From ice water and fountain drinks to fruit smoothies and fresh-squeezed lemonade, this clear plastic lid is the perfect way to top off your cold beverages. For peace of mind and worry-free transportation, this lid has a secure and tight fit. It also features a straw slot, reducing the chance of drips and spillage because no lid removal is required for beverage enjoyment! Best of all, this Choice lid fits various sizes of compatible cups to reduce your lid inventory and eliminate lid / cup compatibility confusion. Our shop has ordered these lids several times in the past and they were always great, but the last time we ordered the lids no longer fit tightly on the cup, the straw slots are difficult to push a straw through. Because of the loose fit, every beverage using these lids leak. Please fix these lids. I have thousands of plastic cups in my shop that I cannot use right now because I refuse to serve customers beverages that will leak on their hands and clothes. Thank you for your review, John! We are sorry this Choice 9, 12, 16, 20, and 24 oz. Clear Flat Lid with Straw Slot - 1000/Case has not worked well for you. A Customer Solutions Representative will contact you soon! Excellent and affordable clear flat plastic lids! I use these with the Choice 16 oz plastic cold cups, and works great! Snaps on tightly to protect from spills, and has a straw slot in the center. Arrived quickly. Packaged well. Stacks well for easy storage. Fits 5 different size cups. What a great purchase. Very clear so the drinks look festive even from the top. Got some of the flat lids too cause it is way more cheaper compare to the dome lids, gonna mix and match it and use them all. These lids fit perfect on the 16 oz cups that we buy. As always Webstaurantstore.com has the best price on the internet. I highly recommend these lids. These baby's snap right in on the choice clear PET plastic cold cups. The best part, you only need one lid to fit all the different sizes! I used it for my 16oz and 20oz smoothies cup. It is nice fit and look clear. It made from good quality plastic. My costumer really love it. Great quality. Easy to use and store. Appropriate for all serving and catering needs. Highly recommended. We use it for cold beverage our servings in the store. The Clear platic lids go great with the plastic clear cups, enough room for any straws to be inserted in the hole of the lid. These lids seem to be a good quality. I ordered them by accident, it's not what I use in my restaurant, but they seem to hold up well. Matches the Choice 20oz Clear PET Plastic Cold Cup as intended. Same quality as other brands for an affordable price so the others have nothing on this product. Fits great on the cups, never leaks, and we have never had a problem with them being cracked. I would recommend to anyone looking for a good quality lid! These lids were recommended for our 16 oz. plastic cup, and they do fit as marketed. They are not the highest quality, but work fine for our use. Lids close tight. Good leak proof seal. None found defective yet. Straw hole is easy to puncture. Overall straws are well built and worth the price. Nice and sturdy and well made. Fits on onto our cups securely. The plastic is nice and clear and great way for presentation when showing off beautiful drinks. Would definitely recommend! We use these for our To-Go orders and they have held up very well, we have seen these hold up very well. they are obviously well made! Lids that are affordable, don't break, and have a great feel to them. We will definitely be buying more of these once we go through this pack! These lids snap on easily and fit tightly to avoid leakage. I also like that this one lid fits both the 12 and 16 oz size cold cups, so there is no need to stock multiple sizes of lids. These lids are easy to place on the choice PET cups. They don't require any extra effort to ensure they are in place. The variety of size cups they fit allow us to diversify our juice and smoothie sizes without an extra expense of different size lids. Highly recommend. We use these lids for serving iced tea in the 24 oz. clear PET cup and have had no problem at all. They are sturdy and tight and wont spill when knocked over. i have never had a problem with these lids, and we use a lot of them every single day. they are really secure and easy to store. It goes without saying that these are as excellent as the accompanying cold cups. Well made, sturdy and could not recommend any other brand other than these. These are great lids that we use with 16 oz clear plastic cups. They snap on easily and quickly. We have a busy lemonade stand that we use these for so no hassle is a must! I have been through many batches of these lids and I can safely say they are amazing. I have yet to have a broken lid. I dont know why you’d ever go back to name brand lids. These Choice lids fit perfectly on my 24 oz Choice cups. They were easy to put on and easy to take off. I also had no problems sticking a straw through the top. What we like most about the Chouce products is that one kid fits multiple cup sizes. So much less hassle when we don't have to buy separate lids . These lids fit my 16 ounce smoothie cups perfectly. Great quality and price compared to the supermarket. No leaks or spills and makes travel a breeze. These lids are made of heavy, reliable plastic meaning they will not bend or get flimsy due to hot liquids. Holes are easy enough to inset straws through and they fit five different sized cups. I have to put two lids on each cup. Thought it was just that case and the I ordered it again. Now I’m thinking I just want to get rid of choice completely not happy with this product it was ok For a while. Very stressful when u hand a drink out and the lid pops off. Hope they improve on the quality. Thank you for your review, Brittany! We are sorry this Choice 9, 12, 16, 20, and 24 oz. Clear Flat Lid with Straw Slot - 1000/Case has not worked well for you. A Customer Solutions Representative will contact you soon! Very pleased with the purchase of this clear lids. I bough them to go with the 16 oz plastic cold cup and they fit perfectly! Even if you fill the contents of the cup to the very rim, it will not spill on the sides because of the secure fit. These are the only lids and cups I will be ordering from now on! Nice quality lid! Fits the cups well and it doesn't leak. They look nice and compliment the clear plastic cup well. These are used for our slushies with the clear plastic cup. They allow the kids to see the fun colors of the slush they chose! I will DEFINITELY NOT be ordering these again. Out of all the things I ordered, these are what I was most disappointed with. The plastic is EXTREMELY thin and low quality. I do not recommend these. This lid does the job. However, with any pressure, the lid just pops off. It wasnt very tight fitting, and when trying to get a straw to go in thr straw slot, the lid collapsed. Thank you for your review, Sherry! We are sorry this Choice 9, 12, 16, 20, and 24 oz. Clear Flat Lid with Straw Slot - 1000/Case has not worked well for you. A Customer Solutions Representative will contact you soon! Great when used with plastic cups has opening for straw we used for out doors sporting events Ensuring lid was safely closed keeping out doors critters away! Those lids fit perfectly with my Choice 16oz cold cups. They are tight enough to hold everything, easy to put on. I don't have any problem with them. Big plus: only need one lid to fit different size cold drink cups. Downside is that the fit isn’t super tight so if drink is very full it can spill over the sides. These lids don't work at all! Working in a coffee shop we have lots of cold drinks during the summer. On a daily basis we have customers spilling their drinks because the lids are loose and leeks. Take a drink and down the shirt it goes. Thank you for your feedback! We are sorry your Choice 9, 12, 16, 20, and 24 oz. Clear Flat Lid with Straw Slot - 1000/Case was defective. Corrective action has been taken and a Customer Solutions Representative is assisting you with your return. These lids are so easy to snap on and the straws go in as well very easily. They fit all the cups advertised. Feels so good that I don't have to buy different lids for every cup. These lids don't work at all! Working in a coffee shop we have lots of cold drinks during the summer. On a daily basis we have customers spilling their drinks because the lids are loose and leeks. Great inexpensive lid for cold cups and fits on the cup easily. Love being able to purchase one lid to fit many different sizes of cups. These lids are perfect for my cups. They go on easily and are easy to remove. I never have a spill problem when matched with the right cup. You have to be careful with how full you fill the cups that go with this lid. This is because the circle jets down where the straw is suppose to go and takes up some additional room, so you lose room for liquid once you put this lid on. We use the lids every day. They work on all size cups. Durable and click on nice and tight. No leakage when mixing drinks with this lid on. These choice flat lids work on the 12 oz and 16 oz cups i also ordered. The have the perfect air tight fit and is not loose at all. Has the slot for a straw as well. This lid we use for a variety of Togo drinks that goes on top of the clear 24oz cup. It fits the cup very well and doesn’t fall off easily. Only downside is that sometimes the lids stick together. These lids are great. They seal on to the cup incredibly well and give structure to the cup as well. They do not take up much space in storage and are easy to put on to the cups. Tight fitting lids, snaps on pretty easy. Very sturdy and stops spilling. The perfect sized hole for straws to enter. Clear and see thru for max appeal. These lids are really great and easy to use i highly recommend these for any choice cups. I would suggest you to buy them the choice is yours. Purchased these lids for use with 16 oz Plastic Cold Cup on this site. Great fit. No trouble getting them apart. Works well with straws. This is a great product, as you can use this lid for many different cup sizes. Lid is durable and snug to the cup. We used with choice cups 20oz an 24oz. These work great! Very inexpensive. The only complaint I have is that the beverage inside the cups tend to spill out of sides easier. Overall happy with these! This cup and lid are the best option for the price, and I have done my research. I ordered these cups and have been very satisfied. A little on the thin side. Would prefer a lid with more weight and durability. While they haven't ripped yet, it feels like they easily could. I use these lids for my customers who want smoothies without whip cream. They are sturdy and I like that they fit many different size cups. These are lids. They tend to stick together and you have to pry them apart, which can be frustrating when trying to get product out the door. These lids are great. Every once in awhile they will be stuck together and you have to pry them apart, but they always fit with a tight seal. Have ordered these lids for over 2 years with only the occasional problem of not being able to get the straw through the perforated top. My most recent order was terrible. They obviously have a new manufacturer as the lids are so flimsy and they pop right off when you pick up the drink resulting in multiple customer spills. Would not recommend. Just what we needed when we started serving beverages at intermission: Cups with lids. we cut down on the possibility of the spilled container with the lids on the cups. Excellent item great price and even better quality. Works just as described. Will be ordering more when needed couldn’t be happier with my purchase Excellent. Love that this lid fits both 9oz and 12oz cups. I ordered both size cups and only had to order one size lid. Lid fits perfectly with spillage and the hole on top holds the straw. I would definitely order again! I purchased these lids to go with the 12oz clear cups for my boba drinks and they are exactly what we needed. Durable, yet very functional and easy for guests to use. I will be purchasing this again! Thank you for your feedback! We are sorry your Choice 9, 12, 16, 20, and 24 oz. Clear Flat Lid with Straw Slot - 1000/Case was defective. Corrective action has been taken and a Customer Solutions Representative has credited your account! We got these clear choice flat lids for our choice brand clear 16oz cups. They fit perfectly on top and look very nice on all our drinks. Very great quality! Good quality and durable for the most part. Like that the lids can fit on multiple different sizes so makes it easier for keeping track and ordering. Fits great in the cups we brought and works with a variety of straws. Looks great and is sturdy! We and the customers love these! This is a durable lid. You need a durable straw to push through cross. Sometimes two lids stick together. Does not fit on the Dart TP16D cup. These tops came in handy when serving our customers their beverages. Perfect fit so there aren't any spills when in a hurry and on the go. I have used these lids for about 6 -8 months now and have noticed. QUALITY CONTROL issues. Sometimes the lids will fit nice and tight and other times they snap on but do not seem very secure. If using with smaller cups 9 oz, 12 oz or 16 oz you may be be ok. But when you move to the 20 and 24 oz cups, it is a crap shoot wether your guests will SPILL DRINKS ON THEMSELVES OR OTHER GUESTS BY ACCIDENT. Works great with the Choice cups we bought. They do feel a little flimsy but they do the job. We will buy this again once we run out. Great for summer days iin the deck! Keeps the bugs ou of drinks and prevents spills from becoming a real issue. They are good for sports events with kids and Road trips too! The kids like putting their names on them so they don't accidentally get someone else's drink. I like that these lids fit all of the cups I have from size 12 ounce to size 24 ounce. They fit good and I haven’t had any issues. These lids are very SImple, easy to use, fits the cups nicely and they are plenty sturdy. No complaints on this product. They separate easily. These pair great with the 16 oz Choice Clear PET Plastic Cold Cups. They look great- sleek and modern. The construction is sturdy. They make our fresh lemonades look great to-go. Great cold cup lids. They fit our 16oz choice cold cups perfectly. No leaks and no problems with the seal. Solid product for commercial use. These lids fit easily on the 16oz cups, have a good quality, and seem durable and not flimsy. DIdn't feel like i was going to break the cup trying to get the lid on the cups like sometimes can happen. These lids are useful for our everyday function as a coffee shop. They are sturdy and reliable and have a snug fit to prevent spills. These lids aren’t pretty thin and don’t really fit well on the corresponding choice cups. I have a hard time getting the whole rim on and sometimes have to push so hard to get it on I end up smashing the cup or crushing the lid. These lids are not flimsy and have a tight fit. Nothing worse than knocking you drink over and having the lid come off. They are sturdy and recyclable. Compared to the cups that the lids fit on, they are a bit too flimsy. Many times customers are worried that the lid will fall off of the cup unexpectedly. Great lids! Perfectly fit to my 16 oz cups. They are very sturdy and lower cost alternative to those brand name red/clear solo cups. Would order again. I haven't used flat lids for my liquid cold beverages yet but this will definitely provide a savings for the beverages that I do not require dome lids for whip cream. These make the perfect salad dressing lids. They are easy to snap on ,easy to see through and easy to write on with a sharpy. These lids fit our Choice cold cups perfectly. They are very leak resistant and work with many sizes. We also use the clear dome lids for drinks with whip cream. We use Choice cups and lids for our slush sales and have been very happy with them. These lids fit consistently well to the cups. They work, and they cost less than Dart Solo. So, we plan to reorder. I purchased these lids for the compatible 16 oz cups so I can take my morning smoothie/fruit juice on the go. The lids are a perfect snug fit, and are very durable. I do not worry about spills, and am confident taking this cup in my car and on the train. Highly recommended! Purchased these for my party business to customize. The size and quality were perfect for what I needed to do. These were the lids to match my clear cups. Will be a returning customer. Perfect lid for our disposable plastic cups. They have a straw slot which is perfect for on the go so there's no mess and especially our little visitors. Love that they fit all of our cups making It so we only have to order one type of lid instead of different ones for different sizes. It is a good lid that does not break easily and stays securely attached to the cup. It is versatile because it fits different cup sizes. I ordered plastic cups so I needed lids for them. These were pretty nice. No leakage & holds pn pretty tight. Clear & Sturdy lids. A great product!!! We use these daily and have no complaints of leakage by our customers. Highly recommend this product due to quality and price. Great lid for the price. They stay on the cup well, the only thing is the slot for the straw is a little tight, but once you get the straw through they work well. These are the kids we use for our iced and blended drinks. They go on nice and snug and the straw slot stays closed so no leaking. These lids are perfect for any cold drink! They fit snugly and don't leak. We've used these for over a year now and we've never had any issues with the quality of the product. A very secure lid when used with the choice cups. no leaks and it very strong and durable. The lids paired with the cups looks great when serving milkshakes. I bought the choice clear flat lids to go with my choice 24 ounce clear cups. It's pretty good quality, could be a little sturdier. I overall recommend it! Nice lids by choice limit the inventory you need, but make sure they fit your cups. They didn't fit some we tried. They are easy to apply and remove, and hold up well with no leaks. These clear flat lids are a nice and easy fit onto the cups and stay on tight. Highly recommend to any company looking for lids. These lids fit great on choice cups of any size. They are sturdy enough without being bulk, and they come at a great price point! These lids are perfect for taking cups on the go. They go on easily and fit tight. The plastic is high quality and has no odor or residue. The variety of cups these lids fit make them an awesome purchase on their own! They have a slot for your state and they seal to the cup we'll. Switched from Gordons lids. Cheaper price equal quality. Larger case count which is nice for storage. Very universal which is a huge plus! I will continue you to order this product and will always recommend it. Ordered the 50 per pack one to have a try. It fit to different sizes as 9, 12, 16, 24 oz. Like this idea, then you don't need to buy different type of the lid. Great quality lids for a good price. Its nice that this lid fits all three sized cups. Makes the barista life a lot simpler when only dealing with one sized lid. A lid is a lid is a lid. The difference with these particular lids, is that you will not find a cheaper price. Good product, great price! Great surprisingly solid lids. The snap on really well well and do not come off. Some of the best drink lids i have dealt with! Choice clear lids for a variety of sizes. This is essential if you do not want to spill your drink. 50 in a pack, you are gonna need cups too! Lid goes on easy and seems to stay put well. I like clear as it shows off the prouduct better. I will be using it for iced chai so seeing inside is important to me. This compatible flat lid fits my Choice 24 oz. Clear PET plastic cold cup perfectly. I needed a lid to use so my smoothies would not spill in the car and this lid does the trick. Excellent price on these lids compared to the big brand names and just as good or better. Easy to apply to cups. Good quality and strength. Just purchase a case of these to accompany the 16 oz cold cups. The fit is great and the quality is right on. Highly recommend to anyone with a similar need. I love that these lids fit so many sizes! It's so much more economical to purchase one lid to fit all your cups. It does what it's supposed to, and keeps our cold beverages in. 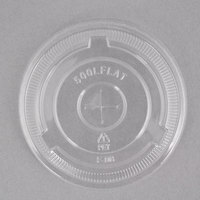 These clear flat lids feature a straw slot and come in packs of 50. They fit Choice cups that are various sizes: 9, 12, 16, 20, and 24 ounces. We really appreciate that these products are BPA-free and recyclable. Love this item, fits great on the 12 & 24 oz cups. Good for drinks on the go. We use it on our horchata and mango drinks. Fits Choice 16 and 24 oz cold cups perfectly at our coffee shop. We tried to switch from Dart but found the Choice cups were a bit thin/flimsy. The lids are great though! Fits tightly without leaks and our larger straws fit in the slot well. Heads up Choice lids won't fit Dart cups and vice versa. Absolutely love that I can use one lid for all of my cup sizes! They are a sturdy lid that stays on and doesn't pop off. The only issue I've had is some sticking together but they are easy to get apart. I love that these lids fit all our cold cup sizes so we don't need extra lids cluttering up the counter. They snap on tightly and securely and the hole for the straw is adequate. The only problem we've had is that every 15 or so lids there are two that are stuck together that won't come apart; this leads to waste. Love these lids! They work for all of our cups which is awesome! I know some of the lids say they fit all sizes, but fails to deliver. Great buy! These are great lids. They hold up well and are very strong and durable. Completely clear. These are the perfect lids for ice tea or and cold beverage. Don't even want to use a regular cup anymore. These lids are so secure, perfect for on the go and especially if you have little ones. lids help prevent slips all over the house! will be ordering more! Must have with the cups. Excellent lid. It Snaps on very easily and is very secure. You can hold the entire beverage by the lid once it is secured. Plus The plastic is crystal clear and looks nice. I love that these lids fit the whole list of cup sizes available. They do a great job being lids and not letting beverages spill, the worst thing I can say about them is sometimes they stick into each other and you end up giving more than one away on a cup. Like the cost of these Choice products over the cost of the other more expensive brands. Quality is just as good but just less expensive. this lid is fit to choice cup. we used to use a solo cup before. we though this cup fit with solo, but it is not... haha it's okay:) if you are looking for cup and lid. you have to buy choice cup and choice lid!! I like that one lid fits on every size of cup. They snap on easily and tightly. We have had no issues with these lids. This lid works perfectly with the 9 oz cold cup which I also bought here. It's really sweet that the website recommended the related items while shopping, very helpful. Absolutely love how these fit so many different size cups it makes inventory SO much easier and staying stocked so much easier. They snap on nice and tight. Lid fits 9, 12, 16, 20 and 24oz portion cups. Works well as a lid for portion cups to carry home sauces and other garnishments. Have to be careful when attaching lid to cups because the plastic becomes deformed and does not stay put on the cup. Nice clear flat lid. Very tight seal but not too hard to put on. Perfect for all drinks. Love the fact that you can buy only 50 at a time! Getting a large cup of smoothie? Having this plastic transparent lid on the cup not only prevents me from making a mess, it holds my straw too! I use these with the Choice 20oz cups for fresh squeezed lemonade. They work perfectly. easy to snap on. Sturdy enough so they don't pop off. I will be ordering these again. Amazing Lid! Very sturdy and sits great! Straw slot is also very nice. I highly recommend using it. I sell drinks in these cold cups. These are decent lines. The best part is that they fit all the different sizes of cups. It really helps with inventory keeping it simple. These clear flat lids worked perfect for the 16oz Choice Plastic Cups from site. So far no issues and all lids have the cups perfectly when snapped on. Lids clasp well to our plastic cold cups. Slit lets the straw pass through easily. Inside the case, they come bagged in set quantities, which makes storing them easy. Perfect fit! I've ordered cups from other stores that would crack or not stay on perfect but these are actually made for the correct cup! This is a product review of Choice versatile flat lid with straw slot. We give 4 stars and 2 thumbs! Very Versatile Lid which fits all Choice cups! I use these for the 16 oz plastic cold cup #999cc16. They are firm and sturdy easy to use. I wouldn't buy the cups without these lids. I am pleased with the Choice brand lids and they fit perfectly with the designated cups. They snap on quickly and provide a snug fit. Even with the straw slot, it keeps the liquid in. These lids fit perfectly on the corresponding Choice plastic cups. They're easy to snap on but also very secure, I knocked my drink over today and the lid stayed on. Used these with choice 9 oz cups for packaging cupcakes (put cupcake on lid and covered with cup--upside down of how you'd have a drink) I would have preferred lids without the straw slot, but those didn't seem to exist. This worked okay. I read reviews for many cups with lids before choosing these. I was very worried that the lids might be fused together, as I've read in negative reviews on other websites. This was not the case. The lids are perfect and snap onto the cup for a nice, tight fit. Had great help with someone pointing me into the correct direction to get the matching lid and cup! no leaking and good quality. I will buy again. The choice products are ok if you are not looking for sturdy. The price is reasonable but we preferred the solo products. Also sold here. It is good and go together with the cups. Nice with clear. It completely fits the cup with no leak. Exactly it is easy to cover the cup too. Top off your cold beverages with this great looking and nice quality lid. Once paired with a straw and cup, it makes it the perfect cup to enjoy your drink in. Very nice lids. Thick and they fit the clear choice cups nice and snug. We use these for milkshakes and they don't pop off or push in when inserting a straw. These are good clear flat lids. They snap on tightly, and have held on even when drinks have been knocked over. These lids are durable and also fit all of our cup sizes. These lids are great. Eco friendly and durable. They have a good wall thickness to them and don't feel cheap or flimsy. These match their 16oz cup well and hold liquid in securely. Works perfectly for our 20 ounce bubble teas, love that these lids fit different size cups which reduces our inventory. Lids snap easily onto cups! These lids are a perfect fit, not one lid was damaged, they also have a great seals on them, no spills. I Will reorder again! We purchased these lids with the cups. The lids fit on the cups perfectly. The cups and lids should come in a combo. The clear lids and cups are basic but have a very clean look. these lids are economically priced and of good quality. It is comparable to solo cups. We use this at the bakery time and time again. The Choice Clear Flat Lids with Straw Slot fit the cups that I had ordered perfectly. The quality is really good and the price is great. Highly recommend! Solid lid. Fits perfectly over the Choice 16z PET plastic cups. I will use them for ices coffee and smoothies at my cafe. I recommend. We ordered these lids to replace some defective lids. Choice makes an awesome product and we are excited to use them. Great cost for the quantity! I love that these choice clear lids can be interchangeable with different size cups. This is a huge bonus. It's nice not having to order a number of different size lids. They fit each size cup perfectly! This lid fit snugly on the 16oz cups that I bought. It is just the same chiche look as the cups and ensure that there is no spill, if the straw slit is not punctured. I like this!! In my house, we have frequent roadtrips and picnics all the time. I hate having to keep track of Tupperware, so I buy portable and disposable options from Webstaurant. These lids go perfectly with the Choice 20 oz clear plastic cold cups, which I use for ice tea. The container is crystal clear, so I love to dress up the beverage with slices of lemon and it makes for a really cute presentation. I also got the large drink carriers to go with them. Bought this for a kids birthday party and they worked great. Nice and clear. They where tight and no spills just perfect for what I need them. like these lids - they are a bit cheaper then others on the side and I don't see why others are more expensive - they all feel the same. Nice lid. Only fits the Choice cups, which makes sense. They are a bit thin, but they seal nicely onto the 16 oz cups we bought so I am not worried about spills. There isn't a lot to say about a flat lid unless it doesn't work properly. That isn't the case with these Choice lids. They fit multiple cup sizes, come apart easily and the straw slot is cut well. They look great on the clear cups. My favorite thing about the lids is that they fit a variety of different size cups. I bought 9oz and 16oz cups and they were a great fit for both. I love the clearness, showing off my colorful drinks. The perfect lids for our iced and frozen drinks. They get stuck together sometimes, though, and are almost impossible to separate, but it doesn't happen too often. These work perfect for what I need I ordered the 12 oz cups with these and I use them upside down for selling individual cupcakes! This is a great basic lid that once it's securely on the cup works great. Just a basic lid, but does the job for our coffee shop cold drinks. It's great that the lid interchanges with all the Choice size cups. I like this product and will continue to buy it. I think it would be helpful to clearly state which cup sizes it fits in lieu of writing "many sizes" in the description. This is a great lid! It fits perfectly on the cup and doesn't leak or come loose. It works perfectly as described and arrived in the mail in just a couple days. Love these. They fir on both of the 9oz and the 16oz cups we use and we have not had a problem yet. Does not come off easily enough to spill a drink. Kid-friendly. True to size for the 12 oz pet clear cups that my daughter use for her specialty fruit infused lemonade. Fits tightly and no leaks. Ordered these to use with the matching cups to use as cupcake packaging and they are perfect! Sturdy enough that I can place a cupcake on top of the lid and the cup portion over it for individually packaging! These lids works really great to keep all your condiments organized and ready to serve. I use them for lunches to keep fruit in them from falling out. These lids are a very cost effective way to save money but still provide a nice look to any beverage cup. We accidentally tipped over the the cup and nothing came out. These lids work great for choice clear cups but will not fit the Dart Solo cup. They look the same but are slightly different size. These lids are it because it makes it so much easier to order for different size cups. The fact that I only need to know one type of lid because it serves to all of my cups is a time saver. These lids work very well. They seal around the edges and the straw slot is so precise that we haven't had anything drip out when passing full cups around. Nice lid that fits the PET plastic cold cup, one lid fit all (12 oz and 16 oz size at least). Perfect for juices and tea. Leak free lid. Would definitely recommend this product. We adore these lids! The last brand we used had very hard tabs around the straw slot and our customers grew frustrated when trying to poke the straw through but with these lids the straw goes in easily! They do tend to stick together but they are pretty easy to pull apart. These lids fit very snug and don't allow for leakage. We are very confident putting drinks with these lids in drink carriers and knowing that they will make it to their destination in one piece. snap actually more smoothly than the previous solo cup lids we have. FYI they do not work with solo cup bases (no surprise) but definelty work well with thier intended counterpart. These lids are great and come neatly packaged and boxed up. They also snap on so satisfyingly and never pop back off of the cup. Price was great too! Since the Pet plastic cups are the best for iced teas, smoothies, iced coffees, anything that you would want a non-flimsy cup for, this is the accompanying lid for it. This is a must have. Order arrived in 2 days. Lids are great. The lids fit the nine, twelve, and sixteen ounce plastic cups that we ordered. Restaurant quality lids for a great price when purchased in bulk like this. I purchased these with the corresponding cups for my friends wedding reception and they worked like a charm, a nice tight seal and made spills not happen with the lil ones. These lids fit nice and snug on my 12, 16, and 24oz choice cups. The perfect seal eliminated the need for a shaker in the making of fresh squeezed lemonade, I simply pop on the lid, cover with a hand towel and shake without any worries. These are nice, secure lids that offer a good amount of resistance for the straw. We mainly had these lids for kids at an Italian soda bar, but everyone from the toddler to the grandmother was glad to have the lids available. Well made product, the clarity of the plastic allows for easily looking inside for contents. Easy to install on 20 oz plastic cups. The cut in the middle allows for easy straw installing. Why order these from your local food service or paper supplier when you can save money by ordering here. Good product, great value, a real winner. Nice high quality lids that we bought for the PET plastic cups. Likes that the box has the lids broken down into 50 lid packs that we take to our site rather than having to lug the whole box. I orders three boxes of the cup lids, and over half of the straw slots are not in center! I have to throw them out customer services told me no one could guarantee the cup lids would all in center! Thank you for the review! We're sorry you were not happy with these! A Customer Solutions Representative will remain in contact with you about this. Amazing product. Worked for a variety of different sizes, and help make drinks from spilling. Definitely recommend, I used this product for my mobile tiki bar. I love the cups that go with these lids, they fit perfectly and include a straw hole. There is never leakage when you turn the cup on its side, the lid has an extremely tight fit. Great product. We use these covers when we sell our snow cones using the 16 cups. they fit tight and snug. no issues with these at all. I have to say that every lid from this Choice company is the flimsiest lid I've ever handled. These cold cup lids work fine and don't worry me like the hot cup lids from Choice. Don't buy those. These lids go perfect with our Choice 160z Clear PET Plastic Cold Cups that we bought from webstaurant store - they easily snap on to the cup and provide a good tight seal so that our milk shakes and smoothies do not leak from the cup. They are lids and they work. No issues at all with the thousands we've ordered. These tend to be very consistent and I will continue to purchase these. These lids are perfect for all of the choice cups that we use for iced coffee, iced lattes and smoothies . They fit nicely without leaking or popping off, which is nice for when we have to mix the ice coffee. These are good, but the issue we have with them is that sometimes two of them will come stuck to each other and it takes a while to separate them. We still buy them for the price is good. We use these lids with the 9 oz cups of the same brand. This combination works great to put our parfaits in or our single cupcakes with this lid as the base. They fit nice and snugly with a nice "snap"
The lid fits most take out beverage containers. Fits securely on them with a clear appearance which allows customers to see which drink is theirs. These lids work great you can turn the cup with the lid one upside down for a second and they will hold the liquid inside, good seal! One of the better flat with straw slot lids I've used. They are not cheap and easily breakable like fast food lids. My only issue, and it is a common issue with "higher quality" flat lids, is that the straw hole is fairly tight and puts extra pressure on the straw when inserted. This closes the straw a little bit, but they still work great. This was combined with the clear plastic cups to serve iced coffee during July in South Carolina. Lots of happy customers. We will buy again. I have absolutely no complaints about this lid. It always snaps tight, we use them on our kids (9 oz) and regular (16 oz) cups and they always work perfectly. Great lids! We love these choice clear lids, I have purchased these lids several times. They have a tight seal, even if cup gets knocked over they don't leak. Perfect for on the go cups!!! Was very please with how sturdy these lids were. They fit nice and securely on the 9oz. disposable cups. They work great with the 9 oz. cups to hold small drinks or to serve desserts. Lids are as advertised. They fit snuggly on the clear choice 16oz cups. I leak tested with a liquid drink by turning the filled cup upside down. No leaks. Great lids. Great cold cup lids at an excellent piece. I use both the 12 and 16 oz plastic cold cups with these, and they've been working out great. Love these lids. not only do they fit on different size cups (saving lots of money) they aren't flimsy! I will be ordering these again, love them so much. These lids work great and securely fit the cups. We use them on our drinks for take outs and for children when dining in. Will definitely purchase again. Really impressed with the quality of this lid. Along with the matching cup, item can be used for a multitude of crafts! Will definitely be purchasing again. These lids fit great with the Choice cups! They are sturdy and also don't pop off when they are on the cups. I strongly recommend these cups. We love this lid with the PET cup. It's a better option for our location since it is easily recycled and BPA free. AND to make this cup better, it is really affordable compared to so many others. We love the lid! Really sturdy and clear and it is a very innovative way to use for a cupcake holder. Everyone love the idea! These lids fit the Choice Clear 16 oz Cup really well! They are great for cold beverages on the go or for kid cups. Highly recommend these! we purchased these to fit a new size cup we needed, the 9oz and 12 oz clear cups. They fit well and go on easy. I wanted a sturdy clear lid for my iced drinks, and I got it with these Choice lids. In fact, they're a little too tough. The straw slot will shred all but the stoutest straws, but I've found a workaround: simply push down one of the quarters of the straw slot before inserting the straw. Once you do that, you can enjoy these tough lids without problem. These work great with the Choice 16 oz Clear PET Plastic cold cup. Stacks are easy to stock. Lids stay on. We haven't had any issues with the lid coming off and we serve these to kids. These lids are a great addition to our stock. We use these with the "Choice" cups and they seal very well. We don't even have to mix our drinks. We can put the lid on top and turn the drink upside down to mix them and there is no leak. I purchased a case of the Choice Clear Flat Lid, to match my Choice Clear Cups. They look nice, and fit very snug onto the cups. Customers don't have to worry about the lid falling off if they grab the drink by the lid. They are much cheaper than buying any where else. I will buy again! These lids are great. They fit tightly on the cup and the straw fits in easily. They get an extra bonus for being recyclable, Why bother with compostable products in a state where commercial composting is not available? These lids are great to have at our events. Very well priced for what you get. They stay on our cups so they work for us! I buy this lid with the 16oz cups. The lid and the cup both are high quality and cheap. I will order it again in the future.. Recommend! You can also use the Choice Clear Flat Lid with Straw Slot - 50 / Pack to present vitamins to friends, family and or loved ones. Instead of giving someone vitamins by hand you can also put on the lids and give it to the person. Nice alternative. This product is amazing. We decided to go with the flat clear lids and haven't been let down. fits 16 ounce cold cups. customers love them and the sleeves fit nicely. This clear lid allows for easy view of the product inside. The slot for is wide enough for most straws and it fits snug on the cups. These lids are great--Priced well and they fit the coordinating 16 oz clear cold cup perfectly. I use the lids and cups at home so my kids can take smoothies and iced coffee to go in the mornings. I would repurchase. These clear lids for the cups perfect. They are strong enough to remove and reinstall the lid if you forget to add something to the cup. I bought these lids to go with the 24oz cups and I think they're truly fantastic. They fit perfectly and they don't break easily. I only wish they had come wrapped or in a bag rather than just out and open in a box. Other than that, excellent. Clear lids easily display contents & snap on tightly to the Choice 12 oz or 20 oz clear PET plastic cold cups. We use the 12 oz for our kids drinks & for our parfaits. These lids fit perfect on the 20 ounce Choice Clear PET cups. The straw hole is easy to poke through too, no bent straws here! These were perfect for my needs to accompany the 9 oz cups to create cups of cake for a party. I will order a case next time just to have these on deck! These lids are pretty loose and it's not close tide. Would not buy again. I can't use it for my restaurant because it feel cheap and it leak upon drinking. Thank you for the review, Jimmy! We're sorry these are not working well for you. A Customer Solutions Representative will contact you soon about the issues you are having with the fit of these lids with their companioned cups. Got this flat lid for my 16oz Choice Pet cups. They fit very well and one lid size fits all of the different size Choice cups! I own a coffee shop and these are perfect for my iced coffees. They have a nice tight seal and straw openings remain sealed until punctured. We often shake and swirl the cups to incorporate syrups and these let us do that with no spilling! Flat lid was nice and came in really quick. Shipping cost was not too bad for this product and the price was great. The straw slot is a little hard to get the straws to go in. We are a bar, but our food is good too so people will bring their young ones with them. When they order sodas, milk or water we put them in the matching plastic cold cup with this lid and a straw. It keeps the kids from spilling. It's also great for taking drinks home. Lids fit the cups snug with no leaks so far. Aesthetically pleasing and highly functional. The price per unit is low and quality is high. We had a dome lid but really wanted to find a flat lid with a straw slot. This one is great. It is sturdy and works great with the 20 oz cup we also purchased here. We are extremely happy with both. We use these on the 20oz Choice clear cups for iced Coffee at the Farmer's Market. They fit snugly on the cups so no drips! They are kind of heavy so you can't just use any 'ol straw, it needs to be a heavier one. Great lids. They fit perfectly for a medium drink. They also stay in place which is nice because we don't want customer to spill their drink. Great lids will fit any size cup , I use this at my coffee shop for cold drinks , love that one size will fit any cup !!! I love these lids. The quality is better than I was expecting, and they fit very well with the 16oz plastic cups. I will be purchasing this product again. Great match to the cups for salad at our outdoor activity. What's a cup without a lid that really fits. Expect to be ordering the pair again soon. The lid is good, fits the choice cups, which we use for our ginger beer, love the cups, so will continue reordering the lids as well! I liked these plastic lids, they are needed if you plan on buying the plastic cups. They fit good for the 12 oz cups. I will order again. These lids fit great with the matching cups. They are strong. You can easily punch a straw through. Once on the cup they fasten really well. These are aweosme compatible to my 16 oz plastic cup so no mre spills withs clear plastic lid with straw slot Very well made !!! Sturdy lid that is easy to quickly put on cups without breaking or bending. Only disadvantage is the small, hard to open straw slot. Regular straws break while being inserted into the slot, and it is not big enough for our bubble tea straws. been looking forever for lids that fit cups for a good price. This is an excellent price. I like that they go on the 9oz cups I buy for my fruit cups, and also for my 20oz iced coffee's. Glad I found this site. I use these with Choice 9oz plastic cups to hold individual cupcakes. There is an inner rim that holds the bottom of a cupcake perfectly. The straw hole is very tight so you would need to use a sturdy straw if you're going to use it. These are just as good as the more expensive brands. They fit the cups just fine and are saving us money at the same time. So happy that Webstaurant sells lids in the exact amount as the cups. These lids fit perfectly and go on easily. Clear lid on a clear cup looks elegant. Great lid purchased these with the 24 oz cup. Made my daughters favorite strawberry lemonade - To Go. without having to go through the drive thru. Make your beverage put a lid on it and go! Great lid and works as well as can be expected with the matching cup. We use these for our regular drinks and the domed lid for our milkshakes. These lids are great and go nicely with my clear pet smoothie cups. I use these lids if the consumer doesn't get whipped cream. If they do, I use a dome lid which is also handy. These are also great for iced coffee! Nice lids for the clear, cold drink cups. Not very thick, and seem flimsy, but overall decent lids for the money. They seem to fit well. These lids keep the drink IN, and the air OUT. At 1000 units per case, these lids should last you awhile, and we've been using them for a couple weeks now and haven't had any spills or mishaps. Great product! Love that these lids fit all sizes of cups so I don't have to search around for all different cup sizes all the time. Love them! These lids pair with the cups we ordered. They stay on and fit great. The only problem is they are "straw breakers" Every person has trouble with the straw holes, pinching so the beverage can't come thru or breaking the straw outright. We've tried different straws but to no avail. These lids work very well with the 16 ounce Choice cups. However, many of the lids in the case I received are cracked and had to be thrown away, and they pinch the straws to the point that customers are not able to drink through them. Thank you for your review, Sandy! We are happy to hear that you are pleased with the quality of the lids you purchased. A Customer Solutions Representative will contact you shortly to credit for the lids that broke in transit. We bought these lids after purchasing the Choice brand 20oz cups. They have a great tight fit, yet are easy to put on, unlike many lids. They do pinch the straw (Choice jumbo wrapped straws), which is frustrating for some customers. These are some great lids, sturdy and well built. The price is great too, the only complaint I have is that the straw hole is sometimes too tight and pinches the straw. i recently purchase some choice brand clear flat lid from webstaurantstore.com and i am so happy with the product. it comes in stack of 1000. The lid is universal and fits cup from 9 to 24 oz cups and has a handy straw slot already cut into the lid. This lid fits perfectly with the choice product. What is great is fits tightly and prevent any splash or spills when transporting it. It easy to put on and really holds on tight. I've bought lid in the past that were such a pain to put on, but not this, this fits seamlessly! perfect!